I have an internal rant about 'family projects' that I'll spare you from. I don't like them but I understand that some families need a reason to interact with each other. We don't. We've got interacting down to a science (more sarcasm because everyday is learn and relearn around here). I have been adamant with all 3 boys that I will help with any project but I will not do their projects. This stance is unpopular and hard to stick with when you see all the extra awesome projects posted on social media or at school. I harbor no ill will for parents who give more help with projects, I'm just not one of them. I love to talk a project through with the boys. I will give my opinion on what I think they should do. I'll take them to Michael's and buy all kinds of things. I have been known to mold clay under the direction of my oldest. Anywho...I completed my portion of the turkey project. I mounted it on poster board and cut it out. I honestly thought B would love coloring the turkey. He loves to color and paint. I could not have been more wrong. He wanted to paint on the left over poster board. Do you want to paint your Turkey? NO! OK buddy, let's color the Turkey. NO! What do you want to do with the Turkey? Nothing. I want to leave it white. I don't think that's going to work. Let's color it. NO!! I'M NOT COLORING IT OR PAINTING IT. IT WILL BE WHITE (mini-meltdown). Take a breath, we'll work on it tomorrow. Tomorrow comes and the Turkey is due the next day. Again, there is screaming and gnashing of teeth and hitting. We try to remain calm. B declares that there will be no paint or arts and crafts materials on the turkey. He asks me what I would do if I needed to decorate a turkey but didn't know how to. I told him how I would color the turkey. My suggestion is ignored. Finally, he declares - ROBO-TURKEY! Now we're cooking with gas, I can do Robo-Turkey! I get out all the gray, silver, light purple, and black crayons. I suggest coloring the turkey all these shades and then putting dots to look like screws where Robo-Turkey is put together. His face tells me this is not a good idea. As does the fact that he's hiding under a kitchen chair. At this point, I exit stage left to take SB to football practice an hour away. Ryan steps in. A trip to Target is promised and Robo-Turkey is colored. Life moves along. But that night, B's book from school is No, David! Ryan reports that the evening could have come straight from No, David! And that breaks our hearts. Something that was supposed to be fun and provide a bit of lovely family time turned into a mess of David proportions and cost us $20 in Legos. Today I'm questioning my choices. Should I have let him leave it white? Was it worth the struggle? Part of me thinks yes. He has to learn that he has to complete tasks that he does not enjoy. Part of me thinks no. Why do I have to keep trying to shove my square peg into a round hole? I, of course, know the answer to that one - because he has to go to school and school likes things a certain way. I'm an educator, I get it. I want school to be a place that all kids can complete assignments in the way that's the best for them. I also know the reality of that is crazy and messy and difficult to manage. It's hard to send home a paper that says "Make a turkey any way you'd like". Most people don't like that, they want guidelines and patterns. I totally get it, I've been there teacher-friend. I am there. I can not imagine managing 18-22 5 and 6 year olds all day long. I understand that those circumstances call for structure and patterns. Kids love structure and patterns. B needs structure and patterns. But, I struggle with making him do a 'non-preferred' task when there's a 'preferred' way to get the same or similar outcome. 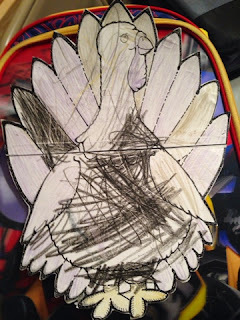 I think B-man would have loved to get a blank piece of posterboard and paint his own turkey.